Grand Hyatt Seoul presents a special Indian food promotion at The Terrace from February 8th to 22nd. For two weeks, you will have the opportunity to taste a wide variety of authentic Indian dishes, featuring India's most popular recipes and savory spices, prepared by guest chefs from Hyatt Regency Mumbai. During the promotion period, our native chefs will be introducing a selection of their homeland's specialties, showcasing the regional cuisines of India with their contrasting flavors and exotic ingredients. Over 30 different kinds of menu items including Skewered Succulent Cubes of Lamb Marinated with Yoghurt and Spices, Succulent Shrimp with Peppers, Onion and Tomato, Braised Rice Flour and Milk with Saffron and Nuts and more, are certain to captivate your taste buds. The buffet price is KRW 45,000 for lunch and KRW 48,000 for dinner, exclusive of tax and service charge. 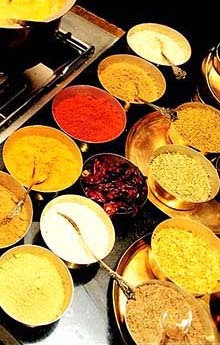 Come to Grand Hyatt Seoul and explore the sub-continent of authentic Indian delicacies, at The Terrace.